If Benedict wants to enforce total public orthodoxy on issues important to Catholicism, he should be consistent. He should demand obedience not just on abortion, but gays and contraception as well. I have a feeling a lot of Catholic conservatives are going to find themselves seeing the bright side of secularism all of a sudden. Which leads to a fascinating question: will the Catholic hierarchy treat Giuliani the way they treated Kerry? And will the theocon right react the same way? That post was composed shortly after 2 p.m., so I guess Sullivan hadn't yet gotten around to reading the editorial in this morning's National Catholic Register. If he had, he'd see it's already begun! A Republican Party led by a pro-abortion politician would become a pro-abortion party. Parents know that, when we make significant exceptions to significant rules, those exceptions themselves become iron-clad rules to our children. It’s the same in a political party. A Republican Party led by Rudy Giuliani would be a party of contempt for the pro-life position, which is to say, contempt for the fundamental right on which all others depend. Would a pro-abortion president give us a pro-life Supreme Court justice? Maybe he would in his first term. But we’ve seen in the Democratic Party how quickly and completely contempt for the right to life corrupts. Even if a President Giuliani did the right thing for a short time, it’s likely the party that accepted him would do the wrong thing for a long time. By now, it's been well-reported that on Monday, March 12, the Secular Coalition for America -- an umbrella lobbying group for eight atheist and humanist organizations -- will announce the name of the first "openly nontheistic" member of Congress. This follows a write-in contest in which the group promised to award $1,000 to whomever could identify the highest-ranking elected "atheist, humanist, freethinker or other nontheist" in the country. Reading the announcement, I took the "openly" part to mean the member in question has granted assent in one way or another to this project, but the release never specifically states that. I do hope it is the case, nonetheless. I've written before about how I think the gay pride movement can serve as model and template for atheists in America, but the last thing I want to see is the kind of self-cannibalism practiced, at times, by the likes of The Voice or The Advocate or, even moreso, the original incarnation of Details. That disclaimer out of the way, now to the fun part...who is it? Over at Hit & Run, Radley Balko lays his chips on Barney Frank, and that does seem to be who the early money is favoring. After all, he's already blazed one trail as the first openly gay congressman -- what's one more? And I will admit that, upon first hearing the news, Barney was the first guy I thought of. I'd intended to ask him the question straight-up when I saw him the other morning at an insurance reform summit I was covering (hoping I'd be able to break the news right here) but he was in and out of there so fast, there was no time for a one-on-one. But the more time I have to reflect on the question, the less likely I think it is that Barney is the guy. Not that I necessarily think Barney is a terribly religious person, but I have to return to that "openly" part. Barney has never openly declared himself atheist or agnostic or secular or anything of the sort, and that's what the contest was supposed to be in search of. Barney has always identified himself as Jewish. And yes, I know, that's a culture and a people and a nation, in addition to being a religion, so the one doesn't necessarily cancel out the other. Nonetheless, it boils down to this -- since Barney has never before declared himself a "nontheist," the only way he would qualify for this contest is if he suddenly decided to do so now. And I just can't fathom anything that would motivate him to participate in that sort of spectacle. It's completely out-of-character for him. So the image of Barney Frank has come to suggest a certain archetype....that of the gay Jewish left-wing intellectual from Taxachusetts, like something out of central casting on a Woody Allen flick. And he is all of those things, it's true. But that doesn't necessarily mean either that he's also an atheist -- the missing trope that would complete the cultural stereotype -- or that any of these individual characteristics are things that define him as a person or a public figure. 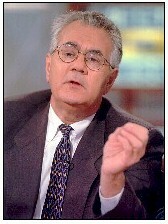 Take it from someone who covers him on a regular basis -- Barney Frank is no shrieking ideologue. He is a serious man, a shrewd and cunning politician who has worked exceedingly hard to be elevated to his current status as chairman of one of the most powerful committees in the House. And much as I'd love to count him as an ally in our cause, publicity stunts like this just aren't his thing. He's got bigger fish to fry, and contrary to how he might be perceived by those who don't really know him, most of his priorities have absolutely nothing to do with his personal life. So I'm ruling out Barney, and turning my attention instead to members of Congress who could, theoretically, have been identified as nontheists by someone responding to this contest. Doing so requires focusing on those members who have never explicitly identified membership in any particular religion, and that does indeed narrow the field significantly. The authority in this area is Albert Menendez, the editor of Voice of Reason, the newsletter of Americans for Religious Liberty. He's been keeping track of the religious affiliations of members of Congress since 1972, and he identifies six members of the 110th as "nonaffiliated": Reps. Earl Blumenauer, D-Ore.; Tammy Baldwin, D-Wis.; Neil Abercrombie, D-Hawaii; Mark Udall, D-Colo.; and John Olver and John Tierney, both D-Mass. Now, I'm not quite sure why this is, but there's some discrepancy between Menendez' count and the one you find at Capitol Advantage's Congress.org. Their site lists Udall as the only member to declare himself "not affiliated." The others on Menendez' list, as well as five more (Doc Hastings, R-Wash.; Chris Van Hollen, D-Md. ; and Barbara Lee, Doris Matsui, and Hilda Solis, all D-Calif.), all are under a separate category for "not stated." In November 2005, this person, a member of the House Resources Committee, compared environmental groups who opposed natural gas drilling to theologians who hold Old Testament certainty in their positions, telling National Journal "you're dealing with fundamentalists," and "we're dealing with sacred text here, that's the problem." He signed on to a May 2005 letter calling for a “thorough and public investigation” into accusations of religious intolerance at the Air Force Academy, following a study by a team from the Yale Divinity School that found harassment of any cadet not an evangelical Christian and special treatment for evangelical Christians. In a letter last May to the Honolulu Advertiser, his wife, Nancie Caraway, complained about Hawaii Lt. Gov. Duke Aiona's religious expressions and asked: "How is this interface of evangelical Christianity and public life any different from those Islamic fundamentalist regimes?" In December, he told a Gannett reporter he was distrustful of "presumed religious imperatives" cited by public figures, saying he had “reservations as to the depth of their commitment on that score.” He went on to say: “History tells me that whoever is in power will make shameless use of their affiliation with God, presumably to their advantage, but more often than not, it doesn't work that way…I differentiate organized, institutional religion from questions of the spirit, questions of moral determinism or my sense of self in the universe. I don't think the record of organized institutional religion is too good on that score." 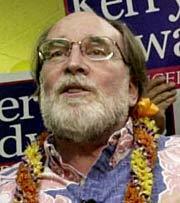 No doubt in my mind....it's Neil Abercrombie. Bank on it. Unlike Barney, Abercrombie LOVES making public spectacles, and getting together with a secular group to tweak the religious right is exactly the sort of thing he would do. Yes, I know the quote about "questions of the spirit" could be read to imply some kind of mushy, Mother Earth, Deist-type religion. I don't think it's conclusive, and in this case, may actually count as evidence for, not against, his candidacy. Remember, after all, that the Coalition characterized this person as a "nontheist," not an atheist or agnostic. Moreover, Abercrombie probably could make the claim of having the least to lose of any member of Congress on this point. Not only is he a long-time incumbent from a safe liberal district, but he represents Hawaii, the least Christian state in the union! Just 68% of the population identifies as Christian, while 9% are Buddhist, 5% Tao and Shinto, and a whopping 18% self-identify as agnostic or non-religious. So, on behalf of the entire secular movement, let me be the first to say "Aloha kâua!" to Congressman Abercrombie, and for my readers -- remember, you heard it here first. What the fook is up with my new governor's eyebrows? 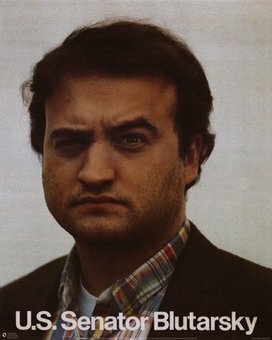 But I'll be damned if I could really pay attention to any of it, as I was kept in a total state of rapture by his Belushi-esque left eyebrow. The damned thing kept floating so far up his forehead, I thought it was gonna finally make a break for it and crawl under his hairline for protection. Bryan Caplan links to a paper by Tim Groseclose and Jeff Milyo, "A Measure of Media Bias," that proposes to measure media bias by comparing how often media stories cite ostensibly "left wing" or "right wing" think tanks with how often those same sources are cited by members of Congress. Leaving aside some of the survey's bizarre choices in methodology -- such as excluding from consideration any citation that labels a given sources as "conservative" or "liberal" -- its base assumption is just ridiculous. Whatever one thinks about the merits or practicality of the journalistic goal of objectivity, the bottom line is that this goal is most emphatically NOT seeking to replicate the same amount of bias that would be held by some "median" member of Congress, or even a median member of the reading public. The goal is to be "balanced." Since Congress is not balanced (both houses are dominated by Republicans) then a media corps that met its own goal of perfect objectivity should be to the left of Congress. That would be what one ought expect. Similarly, a media displaying perfect objectivity in, say, Venezuela ought to be to the right of the Chavez government. While I love this paper, I want to propose a much more straightforward test of media bias: Simply by reading the title of the article, can you tell what the reader is supposed to think about the story? This is amusingly easy. Amusingly easy? Yes. Indicative of a tendency worth pondering? Certainly. Relevant to the broader subject at hand? I think not. 1. Headlines aren't typically written by an article's author. They usually come from the copy desk, who may or may not consult with the writer on the headline's appropriateness. In my day, I've seen some pretty "out-there" heads attached to pieces I've written, to the extent that I've been left in some cases wondering if the editor even read the piece. 3. Headlines are supposed to be punchy. They have to draw the reader into a piece. Perfect balance is a laudable goal, but if it's a choice between punchy but biased, or balanced and dull, the headline writer is going to opt for the latter every time. Mind you, none of this excuses biased headlines, but it wouldn't generally be appropriate to make broad generalizations about a piece's slant just from reading the head. Although one potential experiment to judge the bias of various copy desks -- if that's something of tremendous importance to you -- could be to compare how the heads they give to syndicated and wire pieces differ from publication to publication.